Mid-Ocean Plastics Cleanup Schemes: Too Little Too Late? Imagine using a thimble to empty a bathtub, with the faucet still running. That’s how experts on ocean plastics pollution generally see schemes focused on extracting the debris from the open ocean instead of strategies to prevent plastic waste from getting there in the first place. Interest in methods to rid the oceans of plastic debris is motivated by very real threats to the entire ocean food web. The “North Pacific Garbage Patch” is the most studied of the five subtropical gyres, gigantic whirlpools where waste is picked up and concentrated by slow-swirling currents. There, plastic debris already outweighs zooplankton, tiny creatures at the base of the food web, by a factor of 36:1, according to the latest trawls by the Algalita Marine Research Institute in Long Beach, CA. Subtropical gures The 5 subtropical gyres. Conventional plastics do not biodegrade on land or in water, but become brittle in sunlight and break apart into ever smaller bits of plastic, still containing toxic substances introduced during manufacture – like phthalates, bisphenol-A and flame retardants. 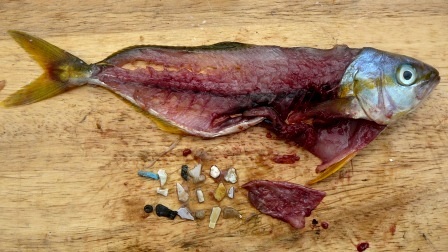 Plastics also attract and concentrate persistent oily pollutants present in seawater. So plastic debris not only threatens sea creatures through entanglement or by clogging their digestive tracts, but also introduces dangerous chemicals into the food chain. Except for the tiny fraction of plastics which has been incinerated, all plastic ever manufactured is still somewhere on the planet. And, with virgin plastics production still greatly outpacing recycling – which in the United States averaged only eight percent in 2010 – our oceans will continue to become more polluted with plastics until something is done to stop it. But given the vastness of the oceans, which cover 71 percent of the earth’s surface or some 360 million square kilometers, the question is, what realistically can be done? There are obvious realities which have to be confronted in any offshore cleanup plan, starting with how to find the debris. Gyres are loosely-defined expanses the size of continents. Even in the center where debris accumulation peaks, the effect is of a plastic soup with fragments distributed throughout the water column to a depth of roughly 20 meters. And, plastics are in no way confined to gyres, but amassing throughout marine environments as diverse as shoreline mangroves and the Arctic seafloor. Next is the challenge of selectively extracting plastics, which become microscopic over time, without destroying sea life, and what about plastics already colonized by sea creatures? Then follows the dilemma of what to do with the plastics once extracted and, of course, how to fund the operation. Moreover, any device deployed in the sea would have to contend with the highly corrosive forces wrought by constant motion, violent storms, and accumulation of bird droppings and barnacles. Two very different, recently proposed cleanup schemes serve to illustrate inherent challenges. The Clean Oceans Project (TCOP) is a Santa Cruz-based non-profit proposing to build a manned, 65-foot sailing catamaran designed to skim from the sea’s surface four common types of plastics that float: #2HDPE, #4LDPE, #5PP, & #6PS. Polymers that don’t float, like nylon or #3PVC, could not be targeted. However, as 80 percent of marine plastic pollution is from land-based sources and predominantly from single-use products made of the targeted polymers, a meaningful dent might be made in the millions of tons of plastic debris believed to pollute the N. Pacific Gyre alone. Gyre currents conveniently sweep floating debris into “streams” called windrows, visible to the naked eye. TCOP’s co-founder, Jim Holm, says that sophisticated technologies already on the open market enable both pinpointing the densest streams for cherry picking and removing floating debris from the water. Plastics are reaped onto a conveyor that, by vibrating, wards off turtles and swimming fish. Creatures which have colonized the debris would be stripped by hand and returned to the sea. 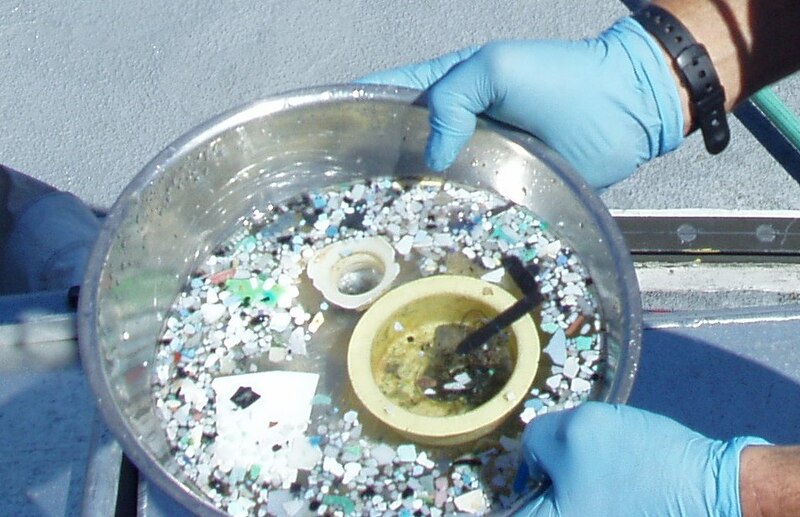 The plan is to target only debris captured by a ¼ inch mesh, as removing the larger stuff should, consequently, diminish microplastics over time. A hand-held spectrophotometer would aid in sorting plastics by polymer. For TCOP, the game changer was stumbling upon a Japanese company, Blest, that already markets a plastics-to-light crude oil converter that can generate a gallon of fuel from eight pounds of plastic waste. There are no toxic air emissions (just water vapor and carbon dioxide) because the plastics are not incinerated, just heated for distillation into fuels. TCOP hopes to create the first-ever shipboard converter to generate enough fuel to supplement the wind and solar sail technology that would power the catamaran. The costly transfer of collected plastics to landfills or recyclers (located primarily in China) would be eliminated. Priced at $199,000, the converter is designed to handle ~500 pounds of plastic in a day. TCOP is seeking funding to deploy a test run in the N. Pacific Gyre. Holm is forthright in dismissing any fantasy that the endeavor would be profitable, acknowledging the indispensable support from corporate and philanthropic organizations. A Dutch engineering student, Boyan Slat, recently made a media splash for a different cleanup design which capitalizes instead on a gyre’s natural currents to sweep debris to a fixed collection vessel anchored to the seafloor. Though few details are offered at this point, Slat conceives of a giant manta ray-shaped platform sporting two long, arm-like booms in an open “V” configuration for trapping floating debris ushered in by the current. The round-surfaced booms would encourage plankton and other creatures to slide under unharmed, while plankton captured accidentally would somehow be separated out by gentle centrifugation. Slat has boldly predicted that only 24 such devices, staggered in a zigzagging line spanning one radius of the N. Pacific Gyre, could virtually clean it up in just five years by removing an estimated 7,250,000,000 kg of plastic debris. He postulates that the venture could be paid for by selling collected plastics to recyclers. Slat’s design is still in the early idea stage, as his Ocean Cleanup Foundation was just founded this year, and he is seeking donations totaling $80,000 to conduct feasibility studies. There’s been no shortage of skepticism about Slat’s proposal. For example, Stiv Wilson, policy director for the non-profit 5 Gyres Institute dedicated to remediating ocean plastic pollution, points out that the average depth of the open ocean is nearly 4,000 feet, twice the deepest successful moorings to date, and that a violent storm can destroy the sturdiest anchoring. Wilson also believes the cost alone of hauling plastics back to shore and to recyclers would exceed their market value. Add to this costly spectrophotometric analysis for sorting by polymer. The issue of whether there could ever be a market for plastics reaped from the sea definitely looms. Recycling weakens plastics’ polymer bonds, so plastics are generally “down-cycled” just once into end-products destined for landfills, like lumber. The first-ever plastic bottle with any post-ocean content, so far housing just one “Method” brand soap, is being marketed primarily to raise awareness about the need for packaging with recycled content. Infrastructure for recycling plastics in general within the United States remains very limited. Also, whether China will continue to accept the majority of U.S.’s plastic waste is brought into question by Operation Green Fence, China’s new policy blocking highly contaminated waste materials from entering. Even if any gyre cleanup devices are ever successfully deployed, alone they could not solve the crisis of ocean plastics pollution, a conclusion that both Holm and Slat share. After recycling, the average American still generates a half pound of plastic refuse daily (USEPA). As consumption of plastics generally parallels development, worldwide plastic waste generation is expected to continue to rise into the future. It seems delusional to believe that open ocean cleanup schemes could keep pace with new plastics entering the oceans. The only rational approach is to focus first and foremost on stemming the flow of plastics into marine environments. 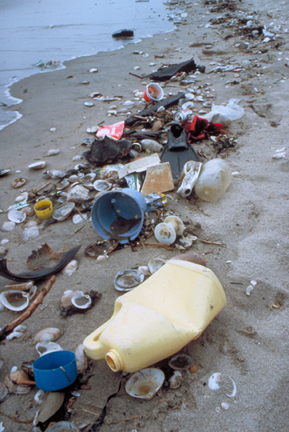 In addition to maximizing recycling and placing barriers at obvious ocean entry points like river mouths, significant societal transformations are needed: for consumers, a shift away from single-use plastics and, for industry, embracing “extended producer responsibility” policies which make producers responsible for the sustainability of what they manufacture. A good start might entail a producer fee on products made of virgin plastics, asking manufacturers to take back and recycle their products, and an end to planned product obsolescence. A study recently published in Marine Pollution Bulletin confirms that marine litter is reduced when plastics are better managed on land. 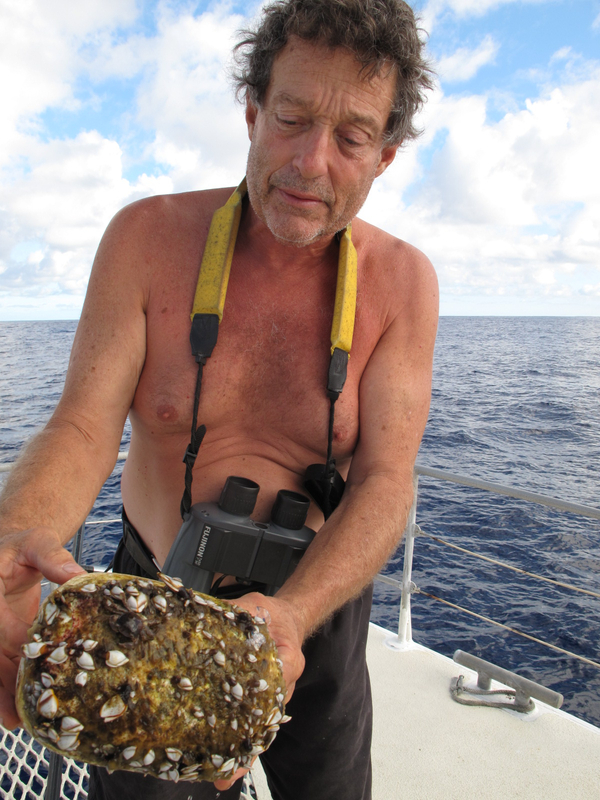 For plastics pollution already at sea, oceanographer and flotsam expert Curtis Ebbesmeyer points out that maybe half a gyre’s contents is jettisoned each rotation, ferried eventually by currents onto shores. This means anyone can lend a hand in gyre cleanup by participating in the annual International Coastal Cleanup organized by the Ocean Conservancy. The next one is on Sept. 21. The article also was published at our online media partner, San Diego Free Press. You don’t have to wait for Ocean Conservancy’s once a year cleanup. Surfrider Foundation’s San Diego chapter (and 84 other chapters along the U.S. coasts) conduct regular beach cleanups throughout the year.